I started keeping track of my rides in January 2010. I had a new road bike, and an even newer Garmin Edge 705 cycle computer. Uploading the details to the Garmin Connect web site after every ride became standard practice. That year I rode 3,173 kilometers. The heat map below shows where I rode for the first six months of 2010. The most-ridden routes are depicted in red. Click on the heat map to open the image in a new window. 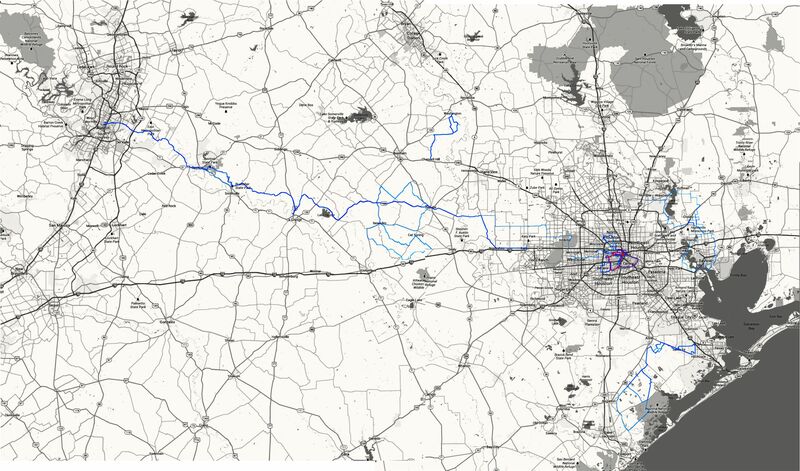 You will see that most of my kilometers were accrued on the West End Tuesday and Thursday evening rides, and the Sunday Taco rides through Houston. I had some big rides outside metro Houston: The Humble Lions Club Ride, The Space Race, and the BP MS150. But I didn’t have a kilo month, which is my term for riding more than 1,000 kilometers in a month. In mid-2010 I moved with my biker chick to The Netherlands. The excellent cycling infrastructure there gave me more opportunity to ride, albeit on my own as I didn’t connect with a cycling group until the following year. I started riding with the Not Possibles in March 2011. The Saturday and occasional weekday rides with them boosted the distance I rode in 2011 to 6,985 kilometers. In 2012 that number increased to 11,054 kilometers. Almost of those kilometers were around Den Haag, with the 2011 and 2012 Ronde van Vlaanderen sportives, and the 2012 UCI World Championships sportive in Belgium thrown in for good measure. I racked up my first kilo month in August 2011. The fine summer weather allowed me to ride eighteen times that month for a total of 1,085 kilometers. Somewhat surprisingly I didn’t have another kilo month until January 2012, when I rode 1,091 kilometers. I then had four more kilo months that year. March, and three in a row from June to August. My Not Possibles friends and I had a good summer that year. My biggest ever kilo month was in July, when I rode 1,718 kilometers. I had the luxury of being able to go on twenty five rides that month. In October 2012 my biker chick and I moved home to Kuala Lumpur. My ride frequency and average distance dropped dramatically for some months before slowly increasing again. So it took more than a year before I had another kilo month, in September 2013. Helped by five rides of at least 100 kilometers each. My 2013 heat map looks a lot like my 2010 Houston heat map in that most of my rides are limited to a couple of routes. Int his case KESAS and the Guthrie Corridor Expressway, with Putrajya and Genting Sempah thrown in for variety. Scattered around the map are the one-off events that I rode in Johor Bahru, Kuala Terengganu, Kuantan and Penang, My Racun buddies and I also rode to Fraser’s Hill, and I joined Dave Ern on a ride to Cameron Highlands. You can also read about the Bike X and Broga 116 rides. It looks like I will ride about 7,300 kilometers in 2013. And perhaps have another kilo month this quarter. Garmin Connect will reveal all. Posted in Cycling in Malaysia, Cycling in Texas, Cycling in the Netherlands, Gear and Tools and tagged Den Haag, Edge 705, Garmin Connect, Genting Sempah, Guthrie Corridor Expressway, Heat Map, Houston, KESAS, Kuala Lumpur, Not Possibles, Putrajaya, The Netherlands, West End. Bookmark the permalink.